Dies R Us: Thank You, Santa! I know some of you will be so busy you won't see this post today, but I'm hoping when you have a minute to catch up later, you will go back and check out all the wonderful cards our design team has shared this week. My choice for today's post is a thank you card! Whether you open your gifts tonight or tomorrow morning, I'm sure you will have lots of thank you notes to send to all the wonderful Santa's on your list! And nothing makes someone feel really special quite as much as a handmade thank you. This one goes quickly enough that you can make it for everyone on your list! I have my fellow teammate, Darlene to thank for the inspiration for this card! She posted a Christmas card using the Cheery Lynn Winter Neighborhood Border & I fell in absolute love with it & ordered it the same day. Well, when it arrived, I had also ordered the plane with banner thinking it would be cute for birthdays, get well cards, or just hello. As I was cutting out the dies, I immediately decided it would be perfect for a thank you above that beautiful border of houses! The dies I used were Cheery Lynn Winter Neighborhood Border, Impression Obsession Plane With Banner & Memory Box Puffy Clouds. Your background can be done in various colors or patterns for even more variety. I'm only posting one version here, but have added several others on my blog so you can see the effect in different colors & patterns. 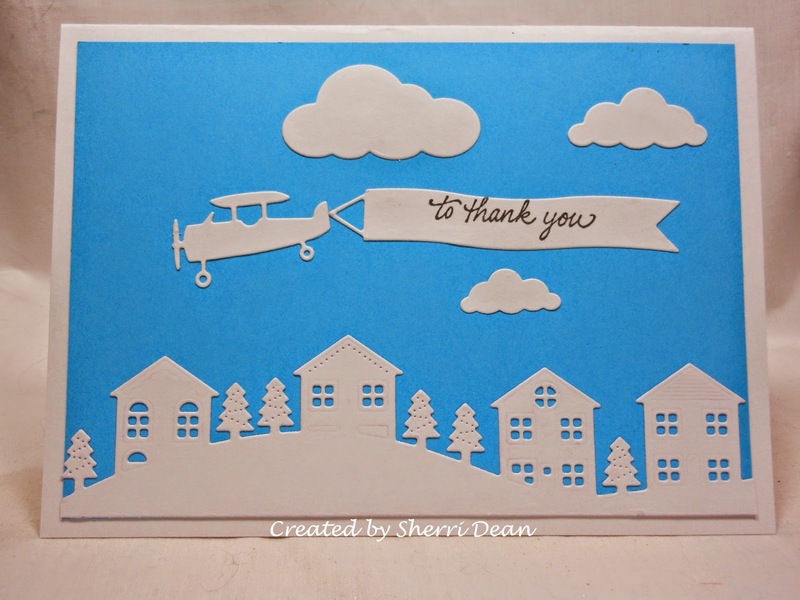 For thank you cards for other occasions, you could easily snip out the trees, leaving just the houses! Or you could do the houses in different colors and add color to your plane as well! With dies, your possibilities are as endless as your imagination! For those of you lucky enough to get gift certificates to the store, I think your special Santa deserves a hug too! Let me wish all of you a wonderful, happy & healthy holiday! And I wish with all my heart that the feelings of love for one another that we feel most strongly during this season will somehow last the whole year long!